This exquisite Mantel clock features a mahogany cherry oak finish case. Rich and deeply colored it is timeless and exquisite. The dial is bright and perfectly brings forward the roman numerals for your ease. 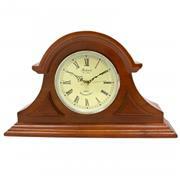 This classic Mantel clock is a stunning addition to any room, whether it is above a fireplace or on a desk. Has 4 chime settings and volume control.